Slung beneath the belly of its L-1011 carrier jet, a three-stage Pegasus XL rocket and its NASA space telescope payload flew away from Vandenberg Air Force Base Tuesday afternoon en route to a distant atoll in the equatorial Pacific where the launch will originate next week. The fully assembled rocket left its home port at 12:58 p.m. local (3:58 p.m. EDT; 1958 GMT) destined for the Kwajalein Atoll in the Marshall Islands, part of the U.S. Army's vast missile range in the central Pacific Ocean. "This is the only air-launched vehicle in the world for small satellites so it really is a special airplane and a special rocket," said Bryan Baldwin, the long-time manager of the Pegasus program at Orbital Sciences. 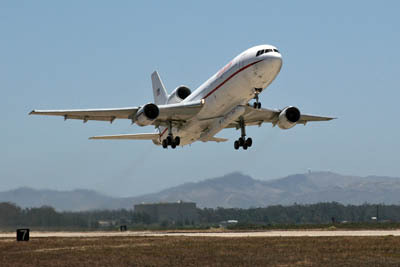 The "Stargazer" jet was wheels-up from Vandenberg's three-mile-long concrete Runway 30 under the control of veteran L-1011 pilot Bill Weaver, beginning the 4,700-mile trip that includes an overnight stop at Hickham Air Force Base in Hawaii. Equipment to provide conditioned air to the rocket has been pre-staged in Hawaii for quick hookup to the rocket once it gets there. The aircraft crew said Tuesday's leg would take nearly five hours and Wednesday's would last about six hours as they use the inbound flight to practice the carrier jet's flight course and test the telemetry communication links between the rocket and range before landing. The rocket will be powered throughout the ferryflight so engineers stationed aboard the aircraft can monitor Pegasus systems and its state of health. 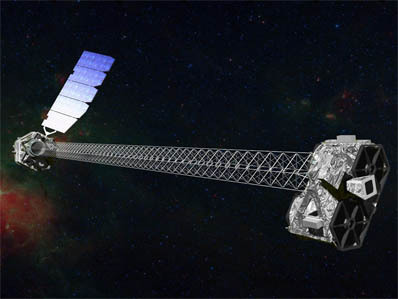 Arrival at Kwajalein will kick off several days of final tests, rehearsals and reviews before the June 13 (U.S. time) launch to deliver NASA's NuSTAR X-ray space observatory into orbit around Earth on a $180 million mission to seek out black holes. The far-away locale is ideally positioned to place the satellite into a 373-mile-high orbit that hugs the equator, going no further north or south than 6 degrees latitude. The atoll is halfway between Hawaii and Australia. 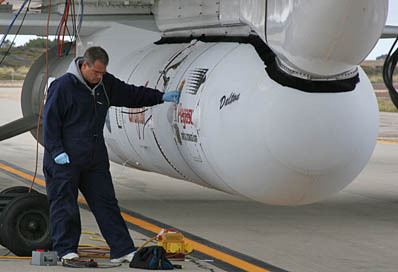 Launch was slated to occur in March, but officials ordered a standdown to complete the validation of enhanced software in the Pegasus' next-generation flight computer. Waiting for the next available launch opportunity at Kwajalein then drove the mission to June. Assembly and testing of the Pegasus vehicle was conducted in Building 1555 at Vandenberg, a large hangar with picturesque views of the Pacific and launch pads used by current Atlas and future Falcon rockets. NuSTAR arrived at Vandenberg on January 27 after a cross-country ride from Orbital Sciences' satellite production facility in Virginia, and was offload into a tented enclosure next to Pegasus for final checks, illumination testing of its solar array, flight simulations, mounting onto the rocket's third stage and installation of the two-piece nose cone around the satellite. The finished product -- a 51,000-pound rocket with its iconic wing, rudder and fins -- was rolled out Saturday morning for the 3.8-mile drive to Vandenberg's runway to join the L-1011. The carrier jet, which is stored in Mojave, California, flew in last week to pick up Pegasus. The aircraft was jacked up, allowing the trailer hauling the rocket to slide underneath. Ground crews hoisted Pegasus and firmly engaged five hooks to lock the 55-foot-long booster onto the L-1011 later that same day. "Processing on the rocket has gone very well," said Baldwin. "The rocket mated up very well, no real issues." A comprehensive combined systems test between all of the elements was run Sunday and the aircraft was fueled Monday ahead of the ferryflight departure. "Stargazer" is flying this mission with three new, fuel-efficient engines on the Lockheed TriStar aircraft originally built in the 1960s and purchased from Air Canada for conversion into the Pegasus launcher. The first leg of the journey to Kwajalein takes the team to Honolulu for refueling and sleep Tuesday night. A separate jet with most of the launch crew left Vandenberg an hour before the Pegasus, flying weather reconnaissance out in front of the L-1011. About 80 people from NASA, Orbital Sciences and the other mission partners are traveling to the remote launch site to support. The planned launch time next Wednesday, June 13 is 11:30 a.m. EDT (1530 GMT), the opening of a four-hour window extending to 3:30 p.m. EDT (1930 GMT). Backup launch opportunities are possible the following two days, if needed, plus the potential for two more, Baldwin said. After that, it could be November before another slot opens up at Kwajalein. "It looks like we got about five days (next week). We've never needed that many days before (to get a launch off)," Baldwin added. "But launch availability after those five days is challenging...But you know how the rocket business goes. Things get moved around and spots could open up." About an hour before the launch time, the L-1011 will take off from the Kwajalein runway, manned in the cockpit by the pilot, co-pilot and flight engineer, plus a pair of launch team members working at consoles where first class would be located aboard the aircraft. The intended drop point is located 150 miles south of the runway, 39,000 feet above the Pacific. With the Orbital launch conductor's approval from the control room back at the atoll, co-pilot Ebb Harris will flip the arm switch and then push the release button to cast the rocket free while traveling at Mach 0.8. After falling for five seconds, the first stage will ignite to begin the 13-minute climb to orbit. "We've had some great launches and hope this will be another in a string of fully successful missions," said Baldwin. Pegasus has launched more than 70 satellites since 1990 and racked up 26 consecutive successful launches over the past 15 years.